Text on the reverse of the ticket (billet): Les lots sont exempts de tous impôts - lots are exempt from all taxes and payable without any deduction. 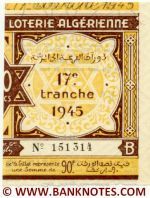 Tirage avant le 29 Septembre 1945. Other texts as well.